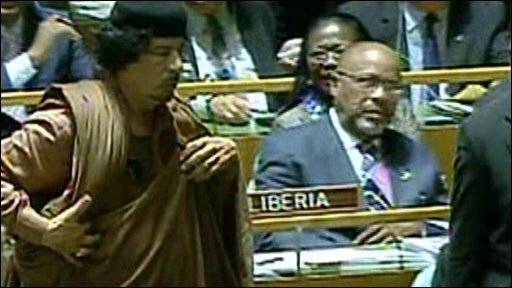 For 96 long minutes, Colonel Gaddafi spoke to UN delegates about Somali pirates, the death of JFK, jet lag and his conspiracy theories about swine flu. Call that a long speech? It's but a tiddler. First up, Barack Obama. Next, for 15 minutes, Colonel Muammar Gaddafi, followed by Gordon Brown. That was the planned running order at the United Nations General Assembly on Wednesday. 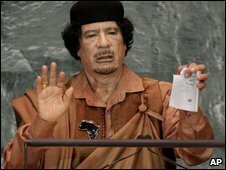 Only instead of speaking for 15 minutes, the Libyan leader launched into a passionate and wide-ranging invective in which he touched on everything from the failings of the Security Council to his theory that swine flu was developed for military purposes, by way of complaints about the time difference and promoting his own website, Gaddafi Speaks. After an hour and a half of Mr Gaddafi speaking in person, it is not known how many of those listening logged on for more. But while lengthy, his debut speech to the UN is by no means the longest delivered to that organisation. Four hours and 29 minutes is listed in the Guinness Book of Records as the longest speech in front of the General Assembly, given in September 1960 by Fidel Castro. 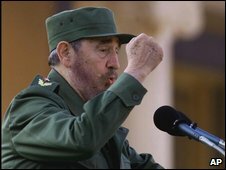 The former Cuban leader is known for his interminable speeches - his longest on record in Cuba clocking up seven hours and 10 minutes at the 1986 Communist Party Congress. Yet Mr Menon's place in the annals of marathon speech making is unusual in that he represented a democracy. "You are only ever going to get long speeches when the speaker doesn't have to worry about the audience running away," says Robert Service, professor of Russian history at Oxford University. "At the UN Gaddafi was depending on the good manners of the people listening. But at home, it is more about the self-preservation of the audience." It was also made in an age when the political elite made long, elegantly constructed speeches liberally sprinkled with quotations, says historian Hywel Williams, author of In Our Time: The Speeches That Shaped the Modern World. "Now [a long speech] is seen as a sign of political weakness, for example Neil Kinnock or Gordon Brown when he uses too many words and too much jargon. "But earlier generations, ending with Harold Macmillan, had a taste for very long speeches which demonstrated their learning. We have now less patience with people who show their authority by speaking at great length." One factor that drives moderately long speeches into the realms of eternity is the amount of time taken for applause. Soviet leaders, for example, gave long speeches with orchestrated applause and ovations, "because particularly in the 1930s those listening didn't want to get arrested", says Prof Service. In the book Gulag Archipelago, author Aleksandr Solzhenitsyn recounted how a fellow prisoner in the USSR labour camps told how he came to be arrested. 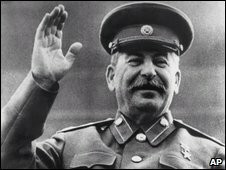 At a local party conference, someone toasted Stalin and "stormy applause, rising to an ovation", broke out. Even though the great leader was absent, it continued. "But palms were getting sore and raised arms were already aching... However, who would dare be the first to stop? "Then, after eleven minutes, the director of the paper factory assumed a business-like expression and sat down in his seat." That same night, he was arrested. And Robert Conquest's Stalin: Breaker of Nations recalls a recording of a speech by Stalin released on vinyl - the eighth side consisted entirely of a standing ovation. It's an anecdote that makes it into Martin Amis's 2002 novel Koba The Dread. Although associated with long orations, Stalin only ever spoke at length while delivering Central Committee reports at congress, as did his successors, says Prof Service. "These were enormously long, but did have to cover economic, political, cultural and foreign policy developments and predict what was going to happen in the next 10 to 20 years. And when Brezhnev did it, he was so doddery that he sometimes read the same page twice. The speech was long enough without that." And when that other communist leader associated with marathon speeches, Fidel Castro, visited Chile in the 1970s to drum up support, Salvador Allende criticised his speaking style. "Allende took the view that his vastly long speeches haranguing the Chilean people were counter-productive," says Prof Service. But the roots of Castro and Gaddafi's oratory lie in ancient Greece, and the first demagogue Cleon, who understood the power of speech to win over the masses. Among the most famous of long speeches is that made by the Athenian politician Pericles at a public funeral for those who had first fallen in the Peloponnesian War. He took the opportunity not only to praise the dead, but Athens itself. 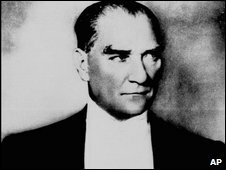 More recently, Mustafa Kemal Ataturk, the founder of modern Turkey, delivered an epic oratory in 1927. Not for him a speech measured in mere minutes - he spoke for 36 hours and 31 minutes over six days.